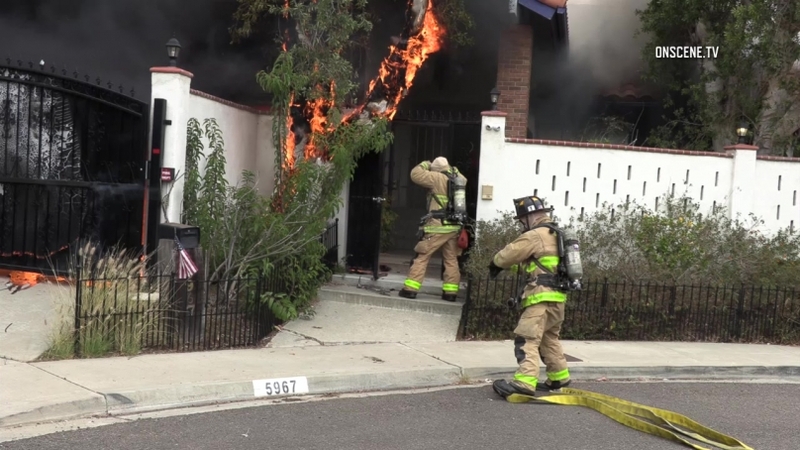 The body of a person believed to have possibly killed himself was found Tuesday in the ruins of a Del Cerro-area home gutted by a late-morning arson fire. The blaze in the 5900 block of Bernadette Lane erupted shortly before 11 a.m., sending a thick plume of smoke into the air near Lake Murray, according to the San Diego Fire-Rescue Department. Crews used a long truck-mounted ladder to douse the fire spreading through the two-story, red tile-roofed structure. It took the personnel about a half-hour to extinguish the flames. Late Tuesday afternoon, authorities announced that the remains of a person, described only as male, had been found inside the charred remains of the home, and that the blaze had been classified as an act of arson. Investigators suspect that the deceased person committed suicide, SDFRD spokeswoman Monica Munoz said. The San Diego County Medical Examiner’s Office was called in to take custody of the body for identification and autopsy purposes. On Sunday, a fire sparked by children playing with a cigarette lighter blackened nearly 40 open acres in the same eastern San Diego neighborhood, forcing scores of evacuations and prompting a temporary closure of nearby Interstate 8.